Gillingham have lost three on the bounce and were on the wrong end of a 4-0 beating at Southend United on Monday. But the mood at Priestfield is anything but negative or downbeat. We caught up with KentOnline sports journalist Luke Cawdell to get the lowdown on the Gills ahead of this weekend’s game. Q: How do you assess this season from a Gillingham perspective, based on the aspirations heading in and recent form? LC: Gillingham were among the favourites pre-season for the drop and they seemed to be heading that way under the management of Ady Pennock. The campaign has improved remarkably since Steve Lovell was appointed in October and most would be just happy with a mid-table finish and to put this season to bed. Q: How is Steve Lovell viewed? LC: He was a bit of a legend as a player, a regular goalscorer for the Gills and would later return, first as the club’s community football officer, then youth coach and he had a spell as part of a successful caretaker management team. He first applied for the manager’s job back in 1992 but the club chose Glenn Roeder instead. 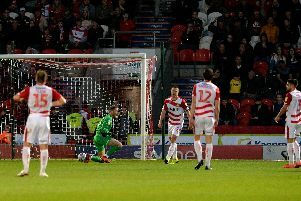 He’s wanted it ever since and has so far made the most of his chance, lifting them clear of relegation and even briefly knocking on the door of the play-offs. The fans are currently enjoying things under Lovell and hope last week’s drubbing at Southend was just a one-off. Q: What style of play and system does Lovell favour? LC: He’s recently favoured the 4-2-3-1 formation but has become known for regularly switching things mid-game, if things aren’t going right. He is certainly proactive on the sideline. His best results have come away from home as he isn’t keen on sitting back, he’ll set his team up to get at teams from the off, something that has caught a few teams out. With right-back Luke O’Neill set to miss Saturday’s game and no obvious replacement, Lovell may choose to revert to wing-backs, but he can be hard to predict. Q: Who are the danger men? LC: One man who has sprung from nowhere is Navid Nasseri, coming on against MK Dons last Thursday and scoring on his first start. He came off the bench on Monday at Southend and was impressive again, playing the attacking midfield role. With captain Lee Martin suspended, he could be the ideal replacement. Raw, with plenty to prove, he’s the kind of player to light a game up.